How many times will I open a French news website and learn of another carnage in my home country? When will these senseless, cruel and barbaric terrorist attacks stop? Once again my heart is bleeding for all the dead, the wounded, the maimed, among them children, back home. This time in the beautiful coastal city of Nice, where my mom spent most of her teenage years. The Promenade des Anglais, the seafront street where the ignominious attack happens, borders a bay called Baie des Anges, bay of the angels. I guess 84 more angels are watching it now. I decided not to cancel my #FrenchFriday post this time, so let me put a smile on my face and talk to you about a lighter subject. 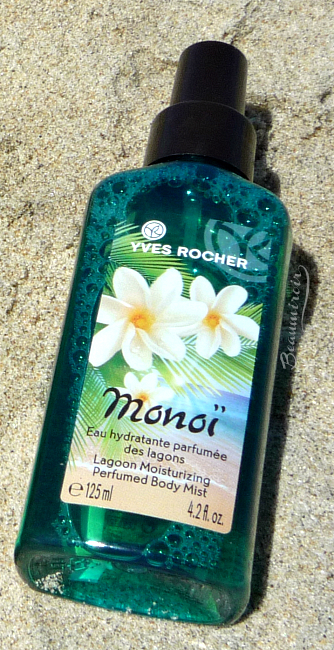 This week I present you Yves Rocher's Monoï bath and body collection, a summer staple. Some of these products have been available every year in the summer for decades, and my mom was buying them when I was a kid, so I basically grew up seeing them around. That's also why I decided to give you a chance to win the Lagoon Hair & Body Wash in my current Summer On The French Riviera giveaway! 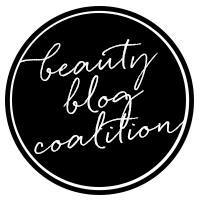 Don't forget to enter by the end of this weekend (July 17th midnight PST is the deadline), and read my review below to know what to expect! Do you know Yves Rocher? I've been told that they used to have stores throughout the US and Canada, but shut them down within the past decade or so. Nowadays their products are available online through their own website - full of poorly translated product descriptions so you get a bit of French flair! 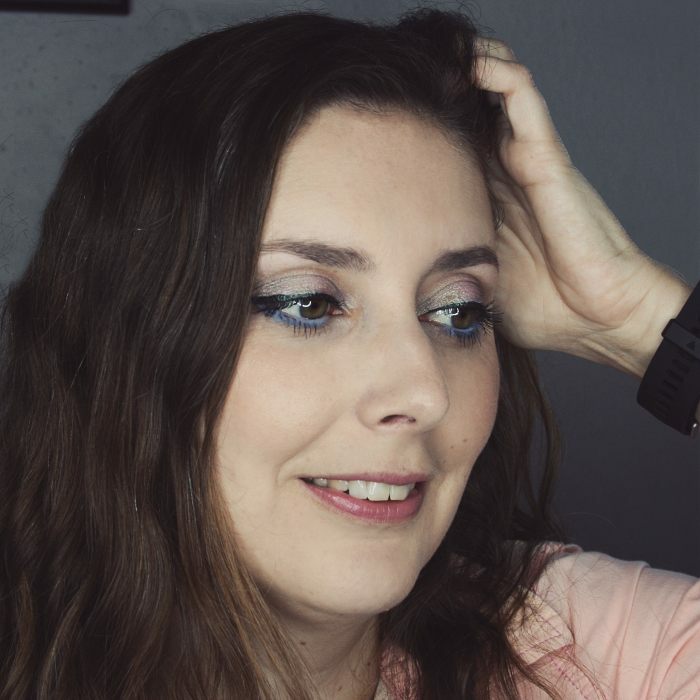 They're a popular affordable cosmetics brand in France only sold directly in their own stores, with a full range of skincare, makeup, bath and body products. They specialize in what they call "botanical beauty", using a lot of plant extracts. They're probably most popular among middle-aged to senior women, although I'm not sure how they have evolved in the past 4 years. You have to be a "member" to get the discounts, and once you sign up they keep sending you coupons for sales and gifts with purchase. My grandmas, my mom and all my aunts loved going there when I was a kid! 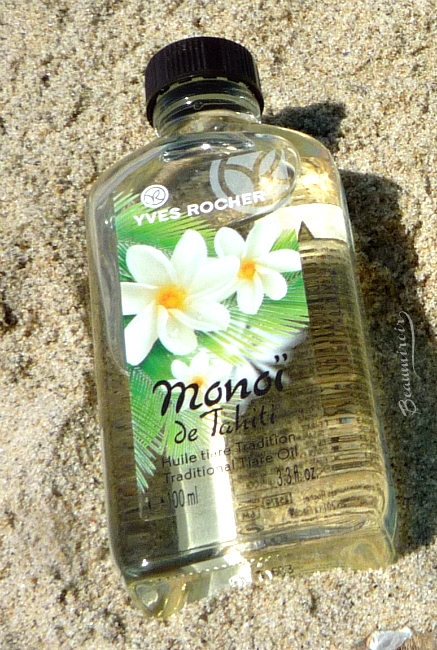 Back to their Monoï summer collection: I've already told you about monoï, this traditional beauty oil used by women in Tahiti made of coconut oil infused with fragrant tiaré flowers, a local variety of gardenia. 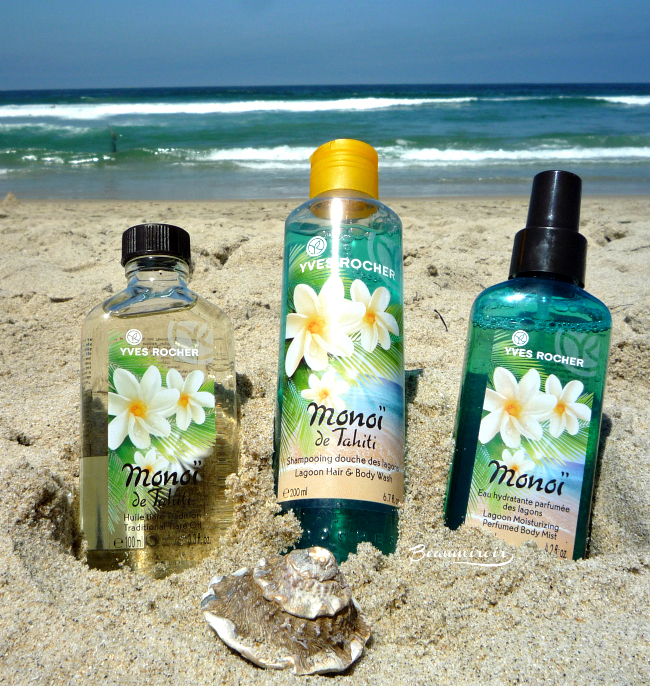 I have an uncle who lives in Tahiti and he would always bring monoï oil back home for the women in the family. 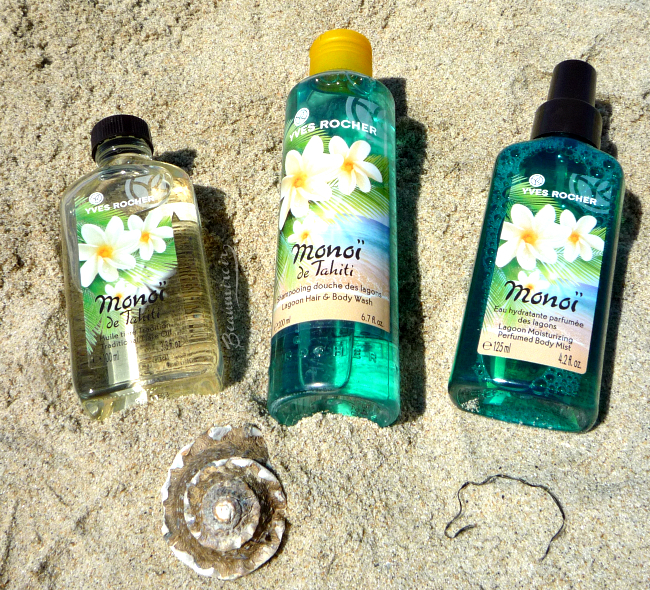 Yves Rocher now has a whole line of products inspired by monoï oil, let's take a look. Despite what the name suggest, this is actually not pure monoï oil, but it contains about 50% of it. I can only suppose that the other ingredients are added to make the oil more stable and more easily absorbed by the skin (pure monoï oil will solidify in the winter, may get rancid after a year or so and it leaves a greasy film on the skin). This oil penetrates really well so it doesn't leave you too sticky or slippery. The glass bottle with a screw top is the classic container for monoï oil, although probably not the most convenient way to store body oil. Be careful not to drop it after use when you have slippery hands! As expected, it smells absolutely divine: it has a strong exotic fragrance with carnal white flowers (the tiaré really reminds me of jasmine, but in a warmer, I want to say more full-bodied version) with a hint of coconut. It's a scent that takes me back to beach vacations in my childhood! It smells like the sun, the beach, a tropical paradise, and it's very sensual. If you like Nuxe Huile Prodigieuse, you'll absolutely love it. Their scents are really similar, with Yves Rocher's monoï oil being a little sharper and less complex. This natural oil can be used on the hair and body, and it's perfect to nourish in the summer. It really softens and moisturizes dry skin and hair tips. I love to use it after a day at the beach when the salt, sand and sun have dried out my skin. I also use it as a hair mask before shampoo to add shine and moisture. Sometimes I'll spread it on my hair and twist it up in a bun before going to the beach so that my hair doesn't get damaged and tangled by the wind and sea water. And of course it leaves its amazing fragrance on the skin! You can take a look at 13 ways to use Nuxe Huile Prodigieuse, this monoï oil can be used in the same way. This 2-in-1 wash is scented with the same divine tropical notes and with its turquoise blue color it really evokes an exotic lagoon. It's free of SLS, SLA and parabens, and it contains aloe juice and monoï oil, together with 98% ingredients of natural origin. I typically use it as a shower gel only, but it's a great versatile product to take on a short getaway to replace shampoo. I love how it makes my shower smell like a Polynesian eden! It doesn't dry out my skin, so I can use it whenever I need a little pick me up. The scent is so summery and happy that it always boosts my mood. At $3 it's so worth it - and Yves Rocher has a 2 for $5 offer! And even better you can win a bottle of this Hair & Body Wash in the Summer On The French Riviera giveaway! Don't wait, you only have until Sunday night, July 17th to enter! This body mist in a turquoise blue plastic bottle boasts 95% of natural ingredients, including organic aloe. It's also paraben-free, and it does not contain alcohol, so it won't dry out the skin. In fact with the aloe and glycerin, it doesn't bring a bit of moisture to the skin (don't expect it to replace a lotion though). The spray delivers a very fine mist of this exotic fragrance, similar to the rest of the line but a little bit more fresh than the Tiaré Oil. It's also less intense, so it's perfect if you want a floral tropical scent to warm up your day. People around you may tell you you smell delicious! - Dry Body Oil: the dry version of the Tiaré Oil in a spray bottle, it contains less monoi than the original. - Precious Dry Oil: in the same glass bottle as the original Tiaré Oil, this is the dry oil version with golden shimmer. 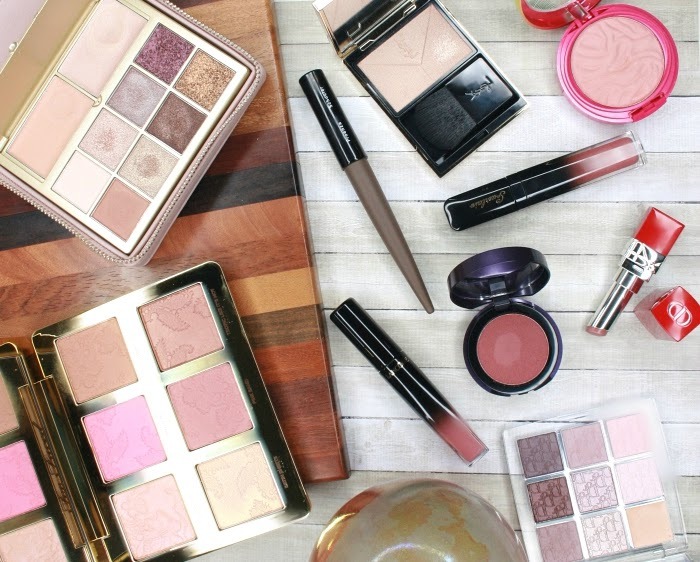 Do you use Yves Rocher products? Have you ever tried monoï? At Yves Rocher's website. Click on the product names throughout the post to be taken directly to their page. As a general rule, avoid buying anything full price: there's always a sale or discount around the corner!